This beautifully decorated NON-SMOKING/NO PET ground floor condo is located at Sandprints Condominium Complex which is located at 60 Sandprints Dr., Miramar Beach, FL. 32550, just 400 feet from Pompano Joe's Seafood Restaurant and the crystal clear emerald water outlined by white sandy beaches of the Gulf Coast. 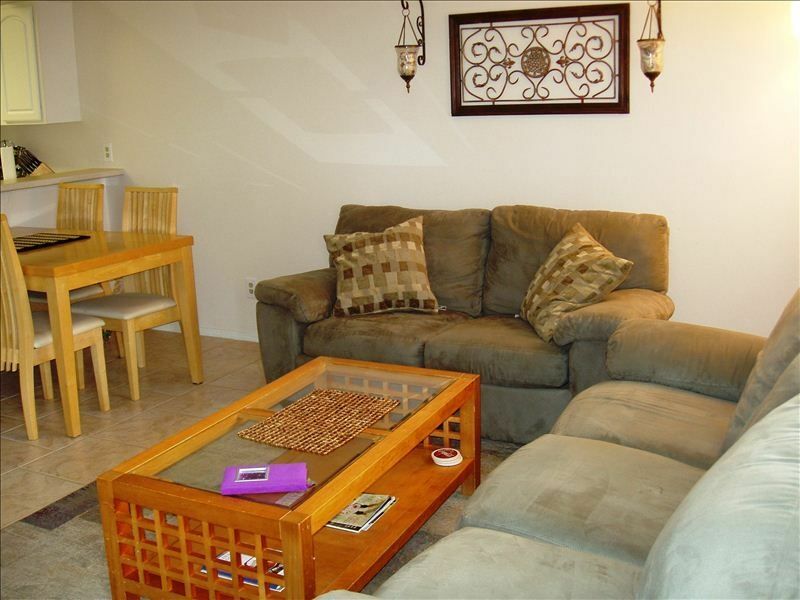 This Condo is crisp, clean, and waiting for you! You only have to pack your clothes and toothbrush, this fully-equipped, one bedroom, one bath condo has everything you need to make your vacation easy including Wi-Fi internet access, two TVs with DVD players, and a stereo. Condo rented at an affordable price, special memories made here are free of charge! We hope you will enjoy our 'home away from home! We loved everything about our stay. The condo is so nice and Bruce is very easy to work with. He accommodated all of our needs and gave some great place to eat at. This was our first visit so that was very helpful. The condo is very clean and cozy. I would definitely stay here again! A wonderful place! 3rd year. This was our third year to stay at this condo and we expect to have a fourth. Everything we enjoy is readily available and all of the things we enjoy doing are nearby. The beach is easily accessible and the pool is always nice. We've never had to deal with issues of noise or unruly people even though the pool is just off the patio. The owner is a joy to work with and the condo is clean, up to date and welcoming. Our home away from home this winter! We stayed here from October 1, 2017 to the end of January. We also stayed here a couple short stays prior to that in preparation for our winter stay. With Laundry, full kitchen and everything we needed to live this place has been ideal for short AND long term stays! We LOVED it! To make it better, the proximity near the beach, great restaurants and shopping and so much more really made it ideal! We ended up moving to the area before our stay was over and one of the first locations we checked for long term rentals was RIGHT HERE! We ended up not far away at a long term only property but we still drive by that way to get a look at 'our beach'. Yes, we call it our beach because that is still the one we go to when we need it. We drive past a few other places to get here, too! Bruce is great and we've become friends in the process. We plan on sending friends and family to him when they visit every time possible. We've traveled all over the world but this is truly a home away from home for us! Thank you Bruce (and family)! This is a wonderful condo conveniently located at less than 5 min walk to the beach, restaurants and shops. The condo was clean, well equipped and ready to be enjoyed. Excellent communication with the owner , Bruce. Perfect place to stay for vacations or week end gateway! Bruce was fantastic to work with. always was quick to respond to emails and made himself readily available if i had questions. I definitely recommend renting from him. I will definitely be coming back again. Had a wonderful time with my family while i was there. i had a great 1st time experience in Destin, FL and will be coming back next year.